A team of University of Toronto students has been named the winner of Hack the Globe, a social impact hackathon looking to tackle international social problems. On March 16, the group of four students, called the DOC Team, competed in the 24 hour hackathon, put on by the Boston Consulting Group (BCG), charity and private equity non-profit, LEAP Pecaut Center for Social Impact, Google Canada, and the tech giants charitable arm, Google.org. The DOC Team used natural language processing to support doctors in rural communities and provide diagnostics to patients. The tool, entitled Digital On-Call Healthcare-Consultant (DOC), is meant as a way for healthcare professionals to get a second opinion and refresh on medical knowledge. Its platform has a symptom analysis and diagnosis recommendations backend that healthcare professionals can access. The team competed against 130 university students from across a number of disciplines addressing various international social impact problems. The event was open to engineering, business, and policy students that had to solve one of 10 social impact problems that is currently being looked at by the Google Impact Challenge. The solutions had to use public, open data and were judged on implementation strategy, feasibility, scalability, impact, user experience, and presentation. The hackathon was part of Global Engineering Week, an initiative working with engineering students to help them think critically about tackling social impact problems. Founded by Malik Ismail, an associate at BCG or former University of Toronto student, Global Engineering Week is in its third year. Hack the Globe, which calls itself the “first social impact hackathon of its kind in Canada” was slightly different from other hackathons in its approach. It offered the students two weeks to scope, refine, and formulate a business strategy. Then on the day of the hackathon, they had to create a technical proof-of-concept. The event also gave the student teams the chance to engage with NGOs and startup, corporate, and other tech mentors throughout the challenge. The runner-up was a team of three students from the University of Waterloo who created an app called Relief that tracks natural disaster survivor needs. The app also has the potential to enable business and the public to donate non-monetary items to survivors. “It was great going to such a unique event that gave equal weight to both business and technical feasibility. This was much more challenging, but also pushed us to create a more robust product,” said Aadit Mehrotra, a University of Waterloo student and member of Relief. Those students aren’t the only ones looking to address international issues; this week another group of University of Toronto students are competing in a different international competition, hoping to win with their low-energy vehicle. 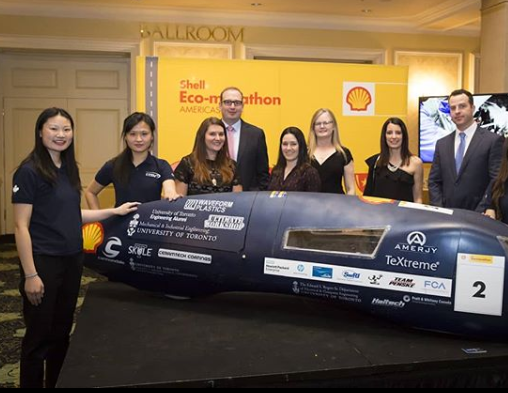 The Carbon-Cutting Racers, are the reigning champs of one of the Shell Eco-marathon Americas challenges, a world leading energy efficiency competition programme for students. Teams are tasked with creating custom designed and built vehicles that consume the least amount of energy. Shell Eco-marathon Americas hosts two competitions, Mileage Challenge, where students compete to see whose vehicle travels the farthest on the least amount of energy, as well as Drivers’ World Championship Regional Final, which looks for energy efficiency and speed and crowns a regional champ to compete in the Drivers’ World Championship Grand Final in London. The event sees close to 1,000 students, split into around one hundred teams, create custom designed vehicles that push the idea of energy sources. Designs have included things like 3D printers, computer-aided designs, with one even using cafeteria kitchen grease as a bio-energy source. The University of Toronto’s Carbon-Cutting Racers’ vehicle is constructed by splicing pieces of carbon. The race is taking place April 3 through 6 at Sonoma Raceway, in California and is open to high school and university students from North, Central, and South America. Carbon-Cutting Racers will be returning, hoping to maintain their winning title.